One usually associates temperate catfish with either the North American ictalurids or the Eurasian wels (Silurus). But there are more to temperate catfishes than just these two groups. An often-overlooked group is the east Asian bagrids, some of which (including the subject of this month's article) are found as far north as the frozen wastes of Siberia. This often comes as a surprise to most people, since one usually associate bagrid catfishes with the warmer climes of tropical Asia and Africa. The tawny dragon (this evocative name comes from the specific epithet, which comes from the Latin fulvus, meaning tawny, and draco, meaning dragon) is one such bagrid widespread throughout subtropical and temperate Asia. It is usually difficult to distinguish between Pseudobagrus and Pelteobagrus, and some species have been bounced around from one genus to another over the years. As a general rule of thumb, species with a forked caudal fin are generally assigned to Pelteobagrus and those with an emarginate / truncate caudal fin are assigned to Pseudobagrus. Like most bagrids, the tawny dragon is a fairly peaceful species that is not too particular about what it eats. It is tolerant of a wide variety of water conditions, and can even be maintained in a warmer, tropical setup. 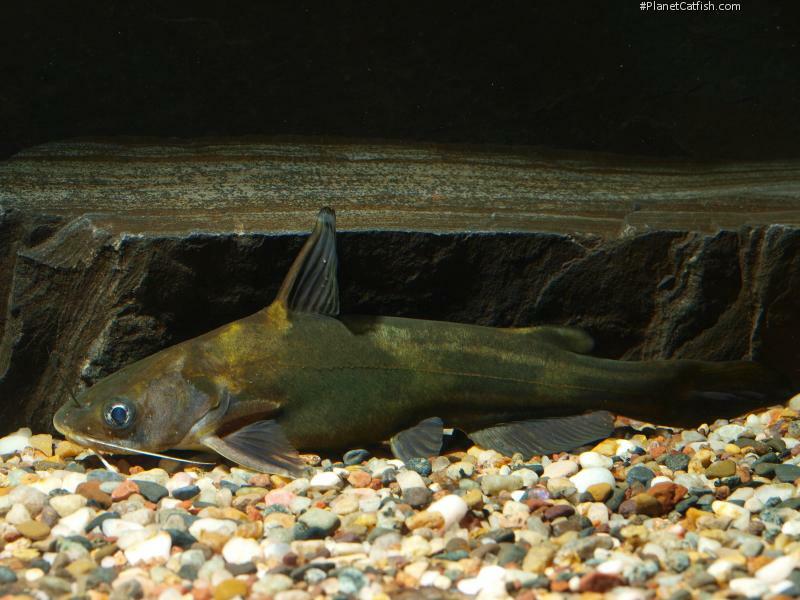 In short, an ideal community catfish were it not for its size. Although somewhat shy and retiring at times, the tawny dragon can be easily coaxed out of hiding at feeding time on the account of its greed. Like other bagrids, conspecifics tend to be territorial but the size of the tank needed to comfortably house more than one fish usually precludes the possibility of having more than one fish in the tank. Although fairly common imports in the aquarium trade a few years ago, the tawny dragon is hardly encountered of late. If properly accommodated, the tawny dragon is a welcome addition to the cold water tank and certainly a lot more colourful than its western temperate brethren. Thanks again to Heok ee Ng for this month's featured catfish and here's hoping its frequency of import does increase in the near future. Etymology The specific epithet is from ''fulva'', tawny, and ''draco'', dragon. Size 345mm or 13.6" SL. Find near, nearer or same sized spp. Yellow back, yellowish white belly, large and dark brown speckles on sides. Elongated body. Strong spines on pectoral fins with anterior and posterior serrations. Dorsal fin origin much before ventral fin origin. Has an adipose fin. Caudal fin deeply forked. Is an important food fish in China and Korea. Soup made by simmering the fish with herbs and spices is considered to be a medicinal tonic in China. Nowadays rarely seen in the hobby (at least in North America and Europe). Sexing Adult males are larger than females. Distribution Nam Ma basin (Laos) and Viet Nam to south-eastern Siberia. Other Parameters A hardy fish that can live in a wide variety of conditions. This is a cold water fish, so heating is not necessary. Can be successfully maintained in outdoor ponds, assuming climate isn't too hot or cold. Feeding In nature, feeds at the bottom on insects (particularly on trichopterans and chironomids), molluscs and occasionally fishes. Not a fussy feeder in captivity. Furniture Inhabits streams and lakes with muddy and sandy bottoms. Best maintained in an aquarium of 55 gallons or larger. Provide ample hiding places. Compatibility Generally a peaceful, solitary fish. Should not be kept with small, slow-moving tank mates, as they may be eaten. As a temperate species, you might be tempted to keep it with goldfish. This is not a good idea, slower moving fish will have fins nipped and scales eaten. Fancy goldfish will fare even worse. Suggested Tankmates Larger cold water cyprinids such as carp, given its propensity for eating smaller tankmates. Breeding In nature, spawning occurs in summer. Males have been reported to guard both the eggs and larvae in the nest hole, previously dug by the male in the clay bottom. Fry typically hatch in two days. Commercially bred in ponds.